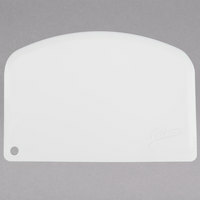 This Ateco 1303 white plastic, straight edge bowl scraper has multiple purposes for bakeries and kitchens everywhere. You can use this bowl scraper to scrape clean batter, icing, or dough from the mixing bowl, so you get more of your product into the baking pan and less in your dish water. You can also use the scraper to evenly distribute icing over cakes, or even cut dough if you're in a pinch. This Ateco scraper is amazing, especially for the price paid for it. It makes scraping out batter and dough much easier and work a lot better than a spatula. You won't be disappointed if you order several of these scrapers so you always have a clean one, but cleaning this scraper is effortless. We only occasionally use these scrapers for actual dough. Usually we use them to smooth the icing on cakes and it works great. It's really helpful for shorter cakes when a taller bench scraper is too tall. They hold up well and are just flexible enough to scrape icing from a bowl. I make a lot of breads, biscuits, quick breads, pizza dough, etc. I never needed scrapers for mixing ingredients uniformly because I use my hands to mix which is really effective. I had a heck of a time cleaning out my dough bowls though before I got these, especially when making a really wet dough. These save me tons of time scrubbing at the sink and allow me to worry less about clogging up my disposal and drains with wet dough. I couldn’t imagine making a wet dough without them now. The bowl scrapers work great. These help a lot in the kitchen when working with dough and thick ingredients in the baking process. Also, the are the perfect shape for scraping product. This thing here may look like a simple piece of plastic, but it is much more. Designed to scrape around bowls with ease. This thing delivers. Awesome scraper with great flexibility. Works great for medium to larger size bowls. It does a particularly good job with sticky doughs. It makes folding and mixing the dough much easier because the scraper fits perfectly in my hand. For scraping, It works much better than silicone spatulas. I will buy more. This Bowl Scraper buy far is one of the most useful items in my kitchen. It has several uses beyond being a bowl scrapper. I utilize this for portioning pizza dough and as a bench scrape. My 16 year old granddaughter has gotten into baking cakes and found this edge bowl scraper great for spreading and smoothing the frosting on her cakes. Using it as a smoother for her homemade butter cream frosting adds that smooth and professional look. She also uses the scraper in some designs. This bowl scraper is great. It is just the right size for me to use in most situations. I would recommend that everyone get themselves a good bowl scraper like this one. This bowl scraper is very sturdy and lasts a long time. It's great for folding large batches of batter where a spatula doesn't quite do the job. Ateco's straight edge bowl scraper is made of a fairly firm plastic, yet is flexible enough to conform to the shape of mixing bowls for scraping batter. WE use these Ateco Scrapers to ice the sides of icecream cakes with whipped icing. They are just the perfect balance between not being too flimsy and not being completely stiff. My favorite kitchen tool of all time! Cleans the bowl so well when making batters. Great for cutting butter into scones. Gets more flexible over time. A+, GREAT PRODUCT FOR THE PRICE! We use these flexible scrapers to get all of our chopped salad ingredients from the mixing bowl to customer's bowls. The flexibility of the scraper allows you to scrape up all of the ingredients, preventing A LOT of waste! This product is a very good value. Super affordable and durable, though also very flexible. Perfect for scraping dough or spreading icing into a cake from a bowl. Really nice bowl scraper that I purchased. I use it as a bench scrapper to clean my station quickly before moving to my next task. It is flexible, just make sure you don't bend it too much. This is great for scraping out all the sides from a bowl of dough. It's not as good as a metal bench knife for scraping a table. Ateco products rarely disappoint and this scraper is no exception. It is just pliable enough to be easy to work with but gets everything up. Great value for these scrapers. For an essential tool such as this, we like how great a value webstrauntstore provides. Very simple, easy to use. Great bench scraper. I use this for lots of different jobs. Hasn't broke or shown signs of wear or tear even after heavy use and washing. I bought several thinking I would be going through them more but I'm still on the first one! Super handy little scraper. Not meant for cutting, but does a great job of removing tacky dough from mixing bowls. Conforms to the shapes very well. This is a must have for any bakery. Nice bowl scraper. Works perfectly for what i need. You can flip it and use it to smooth out frosting in a cake. Its the oerfect size. Very nice bowl scraper. I use this to handle dough when making bread. I particularly like that it is flexible with a curved side that is useful when scraping dough out of a bowl. Inexpensive too! We really like the sturdiness of these bowl scrapers. strong enough to use to scrape cutting boards, but also have a nice curved edge for flexibility to scrape bowls. We also use them for transferring dough and need them to be sturdy enough to lift dense doughs. The smallest of the Ateco bowl scrapers but a useful low cost item to have around that will always find its way into some random usage that will make your life more convenient. The Ateco 1303 seems well built, its a harder and more rigid scraper than the other two larger scrapers (Ateco 1320 and 1321). You can also use it as a bench scraper, divide dough, etc. This product is pretty handy to scrape side bowl. It scrapes the bread dough from the side of the bowl, and it easy to clean and store. You can not go wrong with this scraper. I have bought a bunch of them for use in my school classes. If they can stand up to 1st graders they can stand up to anything. Very simple product, inexpensive, and immensely useful! It's rare that such a simple thing will save you money, and turn into an essential product. If you mix anything in a mixer, or in bowls, you have to have a bowl scrape. Get out every ounce of product and eliminate waste! Ateco quality is great, and the price point is fantastic. Love this bowl scrapper, it works great and I especially love it for cookie dough in a 20qt mixer. I would buy this item again. Good scraper for bakers. I like to use this while making bread or baking. It cleans out my bowls quickly and easily before the dishwasher. This bowl scrapper is so great and does amazing job,it bends a bit which makes it easy to reach every leftovers in the bowl,the price is great for such wonderful quality,I also use it to smoothen my cakes . These scrapers are not as flexible as the WebstaurantStore ones. I like the WebstaurantStore ones better. These work great for scraping off counters but are stiffer than ideal for scraping out bowls. This bowl scraper saves time and money. Such a simple way to get every thing out if the bowl. It also allows for easier cleaning. The classic. It's flexible and bends to perfectly match the contour of your mixing bowl, or works just as well when used flat to scrape down a cutting board or counter. And it's fairly non-stick too, which is great when working with dough. while this bowl scraper is a little bit stiffer / more rigid than many other scrapers i've used, it is clearly very high quality and still flexible enough to work in almost any application as other scrapers. it's a great product which ive come to expect from ateco. Ateco 1303 5 1/4" x 3 1/2" Straight Edge Bowl Scraper (August Thomsen) #1441303 works fantastically helping scrape out leftover cake amd other batters out of our mixing bowls. a simple yet important product for getting all the dough up and the price was right on we have used others and needed to get more will be back ! I think this is a fine bowl scraper if you want an alternative to a silicone spatula. It is versatile because it has the curved edge for scraping bowls and the straight edge can be used to smooth icing.